Arsenal defender Calum Chambers has replaced the injured John Stones in England's squad to face San Marino and Estonia in Euro 2016 qualification. 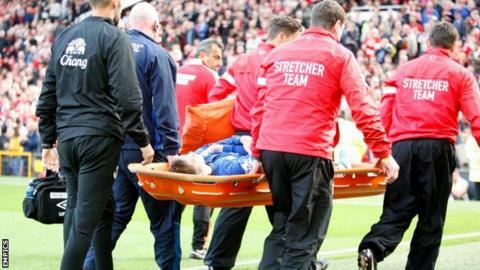 Everton's Stones injured his ankle near the end of his side's 2-1 defeat by Manchester United on Sunday. Chambers, who made his full debut against Norway in September, has been promoted from the Under-21s squad. Everton boss Roberto Martinez said he expected to be without Stones for "the next few weeks". England meet San Marino at Wembley on 9 October before travelling to Estonia on 12 October. Stones made his debut in England's 3-0 win over Peru on 30 May and has won four caps for the Three Lions. He started at right-back in England's 2-0 win over Switzerland in their opening Euro 2016 qualifying match last month. England manager Roy Hodgson had named only three recognised centre-backs in his squad for the qualifiers in Everton duo Stones and Phil Jagielka and Chelsea's Gary Cahill, but he had previously said that Chambers would be called up in the event of any withdrawals. "Calum would be the next one to come in but at the moment is 'loaned out' to the Under-21s," Hodgson said last week. Manchester United defender Luke Shaw was a doubt for the Under-21 side's two-legged Euro 2015 play-off with Croatia after he limped out in the 71st minute at Old Trafford with a knee injury. However, unlike Stones, he will be fit for international duty. "It's not a bad injury, it's a dead leg on my knee," Shaw explained. "Hopefully, I should be training in the next couple of days."